If you are looking for a perfect tool for either teaching or studying human brain anatomy, this Brain model by 3B Scientific Germany with 4 parts is just a right tool for you. This brain is such a great educational tool for those who study the human nervous system and brain anatomy; especially in some cases related to neuro which is practically beneficial for either medical professionals, patients, and students. This 4-part brain is medially divided. All structures of the brain are hand-painted, numbered, and identified in a product manual. The brains right half can be disassembled into frontal with parietal lobes, brainstem with temporal and occipital lobes and half of the cerebellum. This brain is delivered on a removable base allowing us to have a steady and stable presentation. When it is not in use, it could also serve as a perfect display for either school or clinic. EFFICIENT- This 4-part brain is medially divided wherein the structures of the brain are hand-painted and numbered helpful for identification in a product manual. 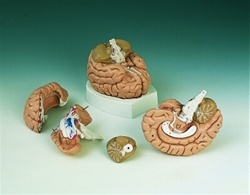 ANATOMICALLY ACCURATE- This brain model is can be disassembled into four parts allowing us to further study the structures of the brain which are practically anatomical accurate. PERFECT EDUCATION AID- This brain is such a great educational tool for the human nervous system and anatomy of the brain. Practically beneficial for either medical professionals, patients or students. COMES WITH A REMOVABLE BASE- This brain model is delivered with a removable base for stable and steady study and presentation. My nephew is a Surgical Technician. He works primarily with neuro cases. He is continuing his nursing and asked for a model. I did lots of research. Picked this brain. He was so excited. He said this was exactly what he wanted and needed. It was going to be excellent help and very beneficial in learning.